Besides one minor 8 page paper, school is done and over with for the semester. So to celebrate, I made a batch of delicious paleo pumpkin chocolate chip muffins for my sweet 80 something year old poetry professor. I was in a bit of a hurry, so an instagram picture is the best I could do. I usually hesitate to post a recipe without at least halfway decent pictures, but I really wanted to share this one! These came out super moist, light and fluffy. Even though it’s May, I will never get tired of smelling pumpkin in my apartment. I just wanted to light the pumpkin candle I STILL have sitting by my couch and drink some warm archer farms pumpkin flavored coffee. Is it Fall yet?! 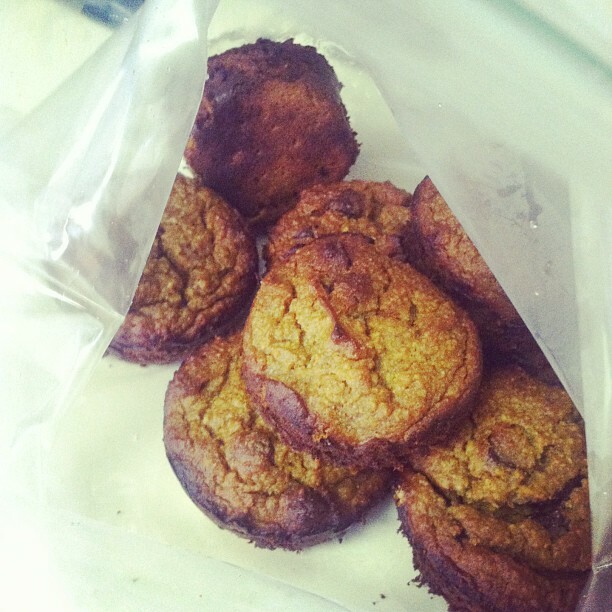 This entry was posted in Recipes and tagged almonds, chocolate chip, dairy free, delicious, diet, fall, fitfluential, gluten-free, healthy, muffins, nutrition, paleo, pumpkin, spring on May 2, 2013 by MaddyMoon. 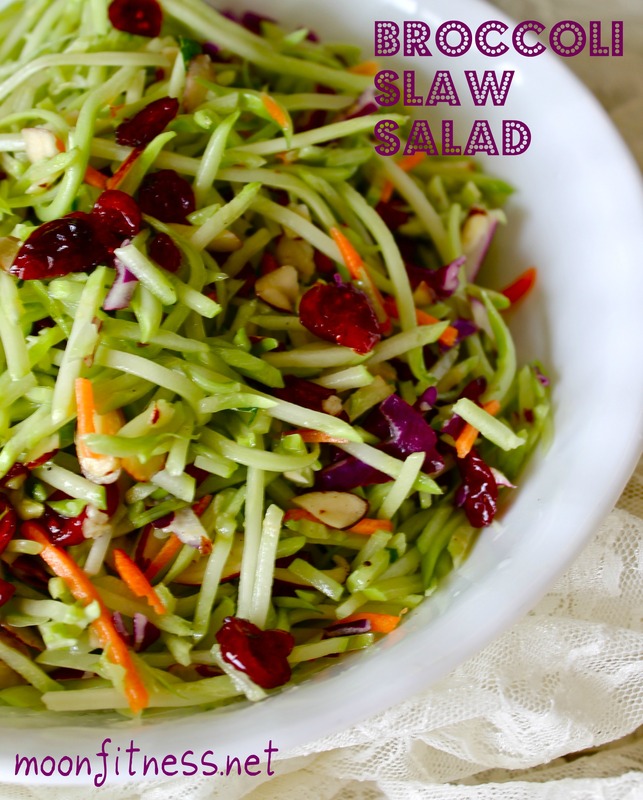 A Recipe to Kickstart Your Spring Tastebuds- Broccoli Slaw Salad! In case you didn’t already know- I’m secretly obsessed with dried fruit and nuts. I want them in EVERYTHING. Salads, oatmeal, trailmix (duh), protein bars, protein pancakes, etc. I love dried fruit but unfortunately I never really treat myself to much dried fruit these days. I had bought some craisins (dried cranberries) in a moment of weakness a week ago and was wondering what kind of recipe I could use it in so that I could eat it a little bit of a time instead of 4 handfuls at once (it can easily be done!). During this initial period of brainstorming, I was having an odd craving for broccoli slaw and then boom. I realized this would be a perfect combination. I had some almond slivers in the pantry too that I needed to use so I quickly got to work making this scrumptious summery dish. Directions:On a nonstick skillet (or in a toaster over), toast the almond slivers on medium heat. Remove the almonds and place them in a small bowl with the dried cranberries. Next, mix the rest of your ingredients in a bowl (except for the broccoli slaw) and whisk together until everything is completely mixed. Add your cranberries and almonds into the bowl. 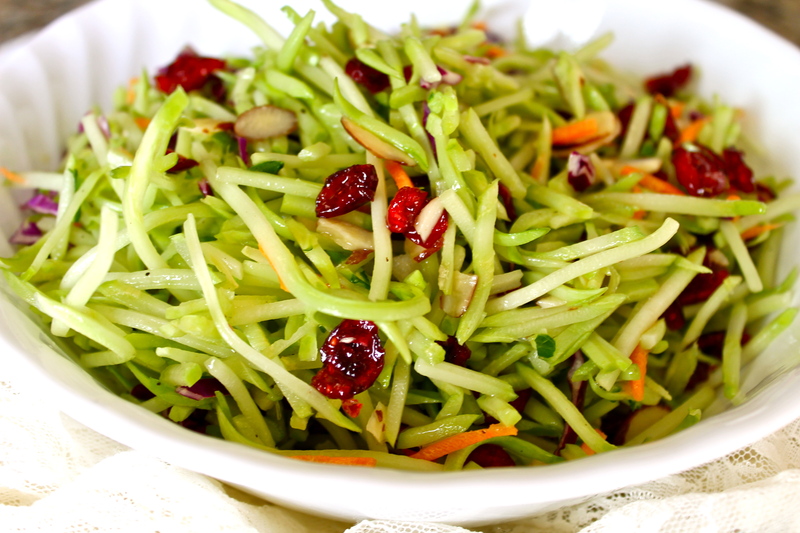 Place your broccoli slaw in a dish and pour over/stir in the dressing. Place the salad into the fridge to chill for a couple hours and then enjoy! Doesn’t that just look so fresh and delicious?! I love broccoli slaw made this way. Some other things you could add into this would be golden raisins, onions, balsamic vinegar, orange slices, cucumber or any other ingredients you like in your salad! Anyways, there’s some other stuff I wanted to share with you today. I’ve kinda kept this on the DL because I don’t want to appear fickle jumping back and forth on diets but for the past week I’ve been doing paleo once more. I did it for several days a month ago and then quickly jumped back on the grain train because I thought I wouldn’t be able to gain any muscle without stuffing my face with brown rice and oats. After 3 weeks of doing just that I felt sick, tired, sleepy, puffy and worst of all- I was counting calories and macros every single day and it was driving me….CRAZY. I can honestly say, after 2 years of counting calories, I need a big break. I’m supposed to be bulking, hello?! This is the fun part where I get to eat CLEAN and train MEAN without having to count every ounce of food and measure all my portions. For bulking, I’m still eating very healthy of course and I have a good idea of portion sizes just by eyeballing it, but now that I haven’t had grains for a few days I’m starting to feel a little hungrier than normal. I think my body is starting to realize carbs aren’t going to be my main source of energy now, but fats as well. I’m planning on eating 1 piece of fruit in the morning and then a little over 1 cup of sweet potatoes after my workout. The rest of my carbs will come from veggies and maybe a few other startchy veggie carbs here and there like yams, if I get particularly hungry. This entry was posted in General Health, Recipes and tagged broccoli, bulk, eat, eat clean, fitfluential, fitness, foodie, fuel, grain free, happy, health, healthy, low carb, mass, meals, nutrition, paleo, primal, recipe, spring, summer on February 13, 2013 by MaddyMoon.